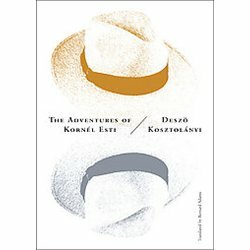 Esti Kornél is one of favorite reads. There is something seductively melancholic about him, perhaps not in this particular piece (which if you forgive me read only in Hungarian) but in general. The parallelism in between yours and Kosztolányi’s piece is unquestionable, yet – I believe – both of them are very authentic, and we admire you for that. Esoisten siratja Mexikot appears to be translated Eva… have you read it? Yes, I have read part of this before visiting Mexico years back (Esőisten siratja Mexicót). However I have read recently the Lagúnák (Lagunes?) and was swept away by it..
I’ve just finished the book and it’s an excellent read. Great for dipping in and out of. A perfect companion for the summer. Highly recommend it.